I was given a LARGE box of cherry tomatoes on the same day that I realised I hadn't remembered to take anything out of the freezer for supper. As Big'Un needed a quick bite before dashing off for rugby practice, I knew I wouldn't have any time to defrost something safely in time. 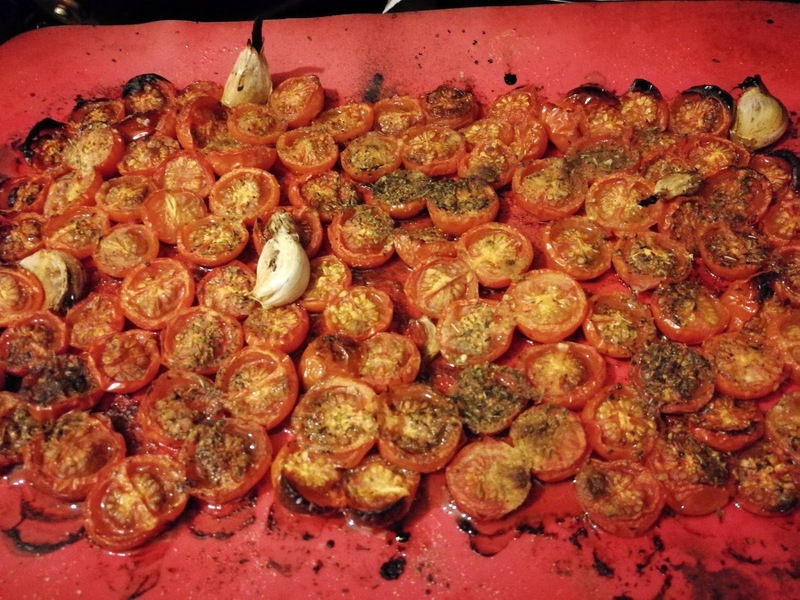 Anyway, the first step was to halve the tomatoes and spread them, cut side up, on a lined baking tray. I then threw a few unpeeled garlic cloves onto the tray. Next, I ground a little salt and pepper on them all, and then sprinkled ground cumin, mixed herbs, garlic granules, onion salt and balsamic vinegar on to them. 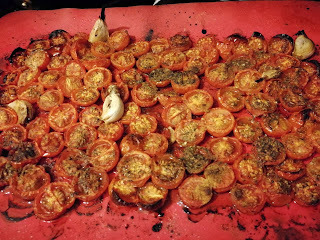 After this point the tomatoes should be soft and slightly shrivelled and sticky. The ones on the edges might look charred - that's all fine. Now you need to blitz these into a smooth sauce. First peel the garlic cloves and discard the skins. Then scoop it all - soft sticky garlic, tomatoes, herbs, spices etc - into a blender, or pour it into a beaker or bowl and use a stick blender, or even a NutriBullet type blender would work. Add a little water if you like and blend until smooth. Make sure you scoop or pour as much of the lovely liquid from the tray into the blending receptacle - it's too good to waste! While this is all roasting, cook your pasta however you prefer, and also fry the bacon until crispy. If you are feeling decadent, add the bacon fat to the pasta sauce as you blend it. I served this so that the plain pasta was served into bowls and the sauce was dolloped or ladeled according to each person's preference, and then the bacon was added almost as a seasoning at the end. Some of the kids had grated cheese as well, but without the cheese was also very good.